Bridge inspectors determined that the damaged Tudor Road overpass, over the new Seward Highway bridge, remains structurally sound, however, one bridge girder is damaged and needs to be replaced. Because of this damage, the current traffic patterns will change. Crews reconfigured the eastbound lanes on the Tudor overpass to create two through-lanes, closing the right-hand lane. 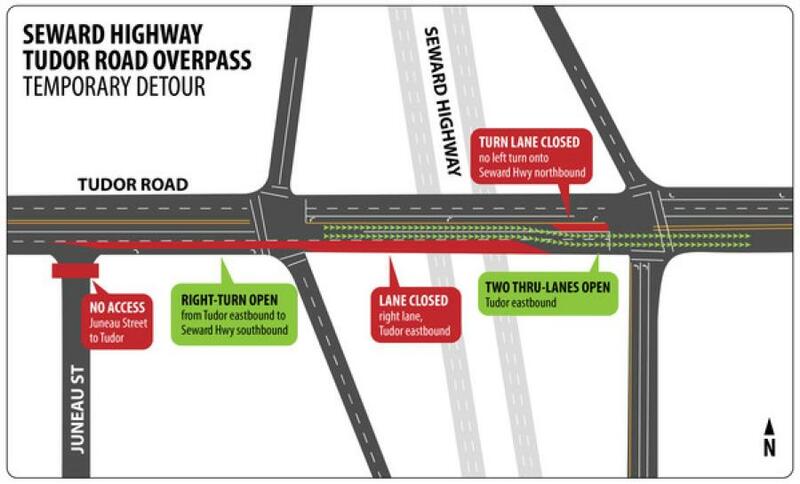 The new traffic configuration will close northbound access from Tudor to the Seward Highway. Recognizing that this closure impacts an important and heavily used road, DOT&PF is working to expedite repairs. If a bridge girder can be manufactured locally, the repairs will happen more quickly. If a girder has to be manufactured out of state, the repair work will take substantially longer. Crews will be removing the damaged debris hanging from the bottom of the bridge. There will be lane closures while this work is taking place. The Seward Highway, Tudor Road overpass is a two-span bridge, 176 ft. in length. It was built in 1976 and has a vertical clearance of 16 ft. The overpass was damaged at approximately 1 a.m. on Jan. 3, when an empty dump truck traveling with the truck bed up struck the bridge.